Hi in this post we will see the overview of JasperReports and how to integrate into JSF application. 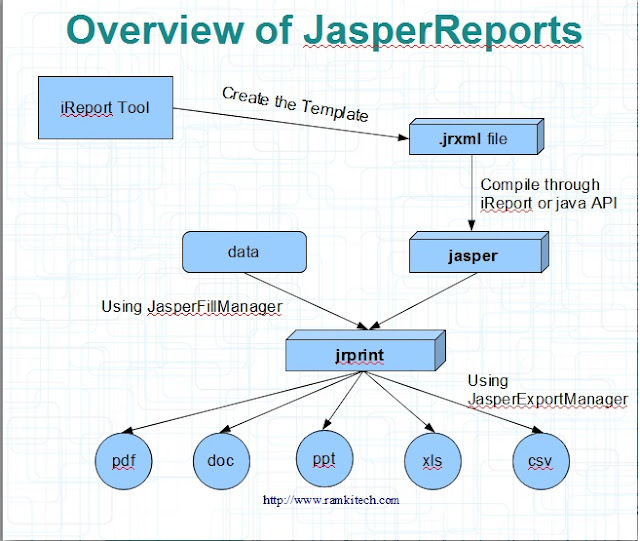 JasperReports is the world's most popular open source reporting engine. It is entirely written in Java and it is able to use data coming from any kind of data source and produce pixel-perfect documents that can be viewed, printed or exported in a variety of document formats including HTML, PDF, Excel, OpenOffice and Word. In Primeface library also use this JasperReports to generate the PDF, CSV and DOC formats with single line of code. see here. but its not flexible and we cant change template. so here we see the how to use JasperReports for create the template and integrate JSF 2.0. We are using iReport tool for crating template. Jasper Reports download from here. This zip contain jasper library and its dependencies and lots sample codes. Now create the simple JSF Application to retrieve the data from database using JPA, then create the template using iReport and then integrate into JSF application. Java Persistence API is standard way to access the all ORM (Object Relational Mapping) tools like Hibernate, EclipseLink, TopLink,.. . These tools are internally use JDBC to access the database. persistence.xml - Its xml file describe the persistence provider (ORM provider) and connection information like database URL, username and password. or data source. Entity Classes - Its normal POJO class for each table in underlying table. This class is annotated with @Entity and some annotation provided by JPA. Its way to express and map the property in the class into table in the DB. Once these entity classes are created then we need to create CRUD methods to wrapping these entities for ease of use. These kind of classes also auto generate from "Session Beans from Entity Classes" option. Here we using GlassFish Server 3. Its supports EJB 3.1. Now we create the JSF page to display the entity classes in table structure and provide buttons for export into variety of formats. Once sample JSF application is completed then we going to integrate Jasper Reports. First, include all necessary lib into our application. We already download the jasper library zip file. Extract this file they have lots of folder. one for dist folder contain main jasperreports-4.1.3.jar file and lib folder contain all necessary dependencies. see the requirements of jasper reports from here. This is flow diagram of JasperReports. 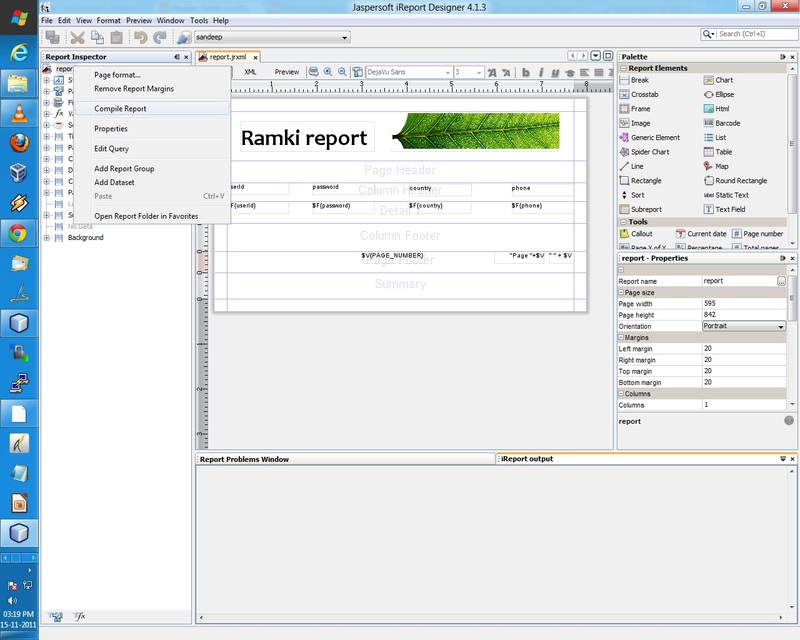 Here we use iReport tool to generate the JRXML template. this file is pure xml file to describe the layout and place-holders. then we need to compile into jasper file. its binary format. this compilation process we can do in 2 ways. Using JasperReport API we can do through programme. now compilation is finished. data is also ready. here data is java beans (entity beans) . This entity beans can't use directly. we wrap into one more class JRBeanCollectionDataSource then using JasperFillManager we generate JRPRINT object. and one more thing we don't want to store the exported format into file system. we need to send these formats to client via stream. here we get the OutputStream via FacesContext. mourad mourad mentioned that report’s absolute path is hardcoded like C:\\UsersramkiDesktopreport.jasper". This doesn't work once you deploy your application in another application server. Yes that's correct. now i fix it.. i used for simplicity purpose. I try to used getResourceAsStream() method. But it wont work. the reason is our report needs some supporting files like images. If ur report contain no image then u can use getResourceAsStream() method. So here i want the path of the report jasper file. Then this report engine get the images from that path.